Growing up in Waterville, Maine, with a large French-Canadian family, I was always interested in history—particularly the history of my family and hometown. Both my parents grew up in Waterville, their forebears having moved there from Canada and Northern Maine not long before. Having my memeres, my tantes, and many aunts and uncles living close by during my childhood allowed me to hear details of life in Waterville through the generations. Those details continue to give me a sense of roots that I especially appreciate now that I live in a much larger city. Having a close-knit family has made it easier for my aunts and uncles to research and put together books on my father’s and mother’s paternal lines—tracing back to France through Quebec. My father’s maternal line— through his mother Stella (Dion) Labbe— proved increasingly difficult for my family to pinpoint on their own, however. Despite efforts by my father and my uncle, it seemed nearly impossible to validate family members past my great-grandfather Francis Dionne. When I began working at NEHGS in 2014, I realized that staff experts might help me uncover questions relating to my Dionne family line. On a staff research night in October, I gathered what information I could from my father—mainly the names of his grandparents Francis Dionne and Ethel “Mary” Paradis and their place of residence, Stockholm, Maine. With this little bit of information, Chief Genealogist David Allen Lambert showed me how to track down their 1916 marriage license. From that document, as well-seasoned genealogists know, I was able to find the names of Francis’s parents, Louis Dionne and Celina Beaulieu. According to this document, both Louis and Celina were born in Canada and Louis was living in Lake St. Johns, Canada, at the time of the wedding. Unfortunately, the document also unveiled that Celina Beaulieu was deceased by 1916.Now that I’ve found this missing link, it will be much easier to find additional documents and continue to trace the family, most likely through Quebec. The next step has been a bit more difficult. Celina and Louis Dionne were common names in Quebec in the nineteenth century; having Francis’s name significantly narrows the search but some couples with that name also had sons named Francis. One clue from my memere: her father Francis had a twin brother. It’s tidbits of information like this, often passed down only through recollection and oral history, that help narrow down potential documents. With the help of other staff members’ research, one Canadian census record has stood out. 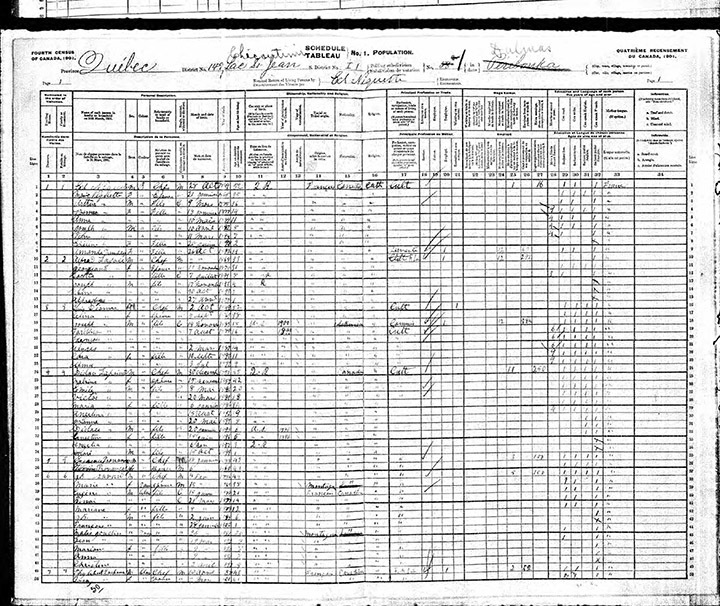 The 1901 Census of Canada lists Louis and Celina Dionne with twins, François and Fardinan, whose birth date (August 7, 1885) matches my great-grandfather’s. I would like to think that this is record is the answer, but first I need to review and potentially discard other census records with similar names residing in similar areas and then I can begin to search for previous generations. Whatever emerges from this research, I am beginning to understand more about the research process and genealogical resources—and the invaluable knowledge that skilled genealogists offer beginners like me. As I assume that you do have command of Canadian French…… check the many genealogical sites in Canada (Acadia, New Brunswick, Quebec) that are so relevant to your family’s amazing story of survival. Another good source would be the State of Maine’s own archives in Augusta. And of course the University of Maine, Orono has both a Franco -American Center and an American -Canadian Center as resources for you, as well. In your interest in the Expulsion, I assume that you have read Faragher, ” A Great and Noble Scheme”……. Upon reading Faragher’s work— it can only be concluded that it is about time that the descendants of the Puritan “dons” such as Shirley and Morris — totally responsible for what can only by termed an ethnic cleansing of the Acadians……. offer up a long overdue apology for the malfeasance of their kinsmen ? I am a Canadian Francophone, who’s grandfather was born in Quebec, and my mother was born in France. I don’t know what you mean by Canadian French? French in Quebec and in France is the same. They just have a bit of a different accent. What about the famous Dionne quintuplets? A multiple birth, a same family surname. Canadian locale…perhaps their family is well researched and perhaps related or linked indirectly. More clues might emerge by attacking the problem sideways instead of head on. Of course, the Archivists per -non at the Maine State Archives and Franco American and State of Maine historian per- non, Tony Dionne, would be an awesome resource. He has extensive knowledge of his own Dionne family genealogy within both the State of Maine and Canada. Hi Viola, Thank you for the feedback! I have read “A Great and Noble Scheme” and I think it’s one of the best, all-encompassing works on the deportation. Thank you for the suggestions on where to look further into the Dionne family too. The Maine State Archives are a great resource and I would love to go back there now that I have started on my own genealogy. Hello there! I am a Dionne dependent in CA and found this article by EJ Dionne of the Washington Post and NPR you might enjoy. Take care…we must share some DNA somewhere! All Dionnes in North America descend from Antoine Dionne who immigrated to Quebec around 1660 and apparently changed his name from something else. So yes, the Dionne quintuplets and the journalist EJ Dionne are almost certainly distant cousins. A limited number of families came to Quebec in the 1600s and early 1700s, and then immigration stopped. 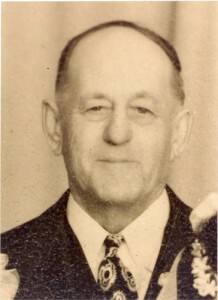 If you work at it, you have a fairly good chance of connecting any two people with French-Canadian roots, and the accuracy and completeness of church records makes it easier, especially since wives maiden names are preserved in many records. Hi Mark – Thank you for sharing this. I will keep Antoine Dionne in mind as I move forward. I’m sure it will help to fill in the gaps. Antoine Guyenne, was his name when leaving France, the last name was changed to Dionne once in North America. Sorry for the misspelling of Antoine’s last name, it’s spelled Guyonne, 1641-1721, his wifes name was Catherine Ivory 1644-1709. The Dionnes of America (les Dionne d’Amerique) Association has never been able to determine for sure what their name was in France, or where in France Antoine came from. Most families in France had many different spellings (i.e. Dionne, Guyonne dit Sansoucy, Guyon, Dienne etc.) There would even be different spellings within the same family i.e. by making the name feminine for a daughter for example (Guyon to Guyonne, Dion to Dionne. It’s only after Napoleon became emperor that France gradually started to stick with one spelling. But, then when immigrants came face to face with an Immigration Officer, the spelling would change. Most immigrants could not read or write, so the IO would write the name as it sounded. That happened to my mother who immigrated from France to Canada with her family at the beginning of the 1900s; yet my grandfather could read and write. I just recently found that out in researching the ship they arrived on. Unlike the case of the English woman in British North America, French women held a higher status and unlike the women of the British colonies had their maiden names documented. French Canadian genealogy is much more thorough as a result. I would like to mention that another excellent resource is Father Robert Parent. A Catholic priest and French Canadian genealogist based in Lewiston, Maine. This is a good tip – thank you J! It would be interesting to find the connection there. Speaking of famous Dionnes, maybe I can find a connection to Celine Dion as well! Can’t wait to find out more. Dionne and Dion are distinctly different families. There were several Dion ancestor pioneers who came from France, including Jacques Dion, Jean Guyon (Dion), Philippe Dion, and Pierre Dion. In addition there were Thomas Dion and Nicolas Dion, but I cannot say they have descendants today by that name. Pierre Burton, a well-known Canadian writer now deceased, wrote a book on the Dionne quintuplets. If you want more information about the Dionne family that came to New France in about 1662 (Antoine Dionne with his wife Catherine Yvory – or Ivory, you can do a search on the Dionnes of America’ (Les Dionnes d’Amerique) – a fairly big Association that connects the Canadian and American Dionnes. I was born in the Province of Quebec and I am a retired teacher of French and Spanish. I can help you with your Dionne & Beaulieu family tree. I have found a marriage record for Louis Dionne Young and Célina Beaulieu who were married at St-Joseph Church in Old Town, Penobscot County, Maine, USA. on September 25, 1869. If you would like to have this document and what else I found, please contact me at my e-mail address. I found this record on the site BMS2000 located in Quebec. I am working on the Dionne/Desjardin line in Maine and Canada and could use any information that you might be able to help me with. My grandparents were Ozime Dionne and Blanche Pelletier from Old Town Maine. I believe my grandfather was from Connor Maine and my grandmother from New Brunswick but they talked of relatives in Quebec. Tricia, I might be able to help you in your Dionne & Beaulieu Family tree. I was born in the Province of Quebec and I am a retired teacher of French and Spanish. I found a marriage record for a Louis Dionne Young & Célina Beaulieu on the site BMS2000. This record shows that this couple was married September 15, 1869 in the Parish of St-Joseph, Old Town, Penobscot County, Maine, USA. If you think this might be the couple you are looking for, I shall be glad to send you the document and other information about this couple. Hello. My grandmother was Lillian Zoa Dionne from Kankakee, Illinois. My sister and I didn’t know much about lineage except that she was from a large French Canadian family. In the past months we have been delighted to assemble a tree of her Canadian line back many generations using a combination of church records, and the reference: Quebec, Genealogical Dictionary of Canadian Families (Tanguay Collection), 1608-1890. We also use DNA matching to confirm cousin matches which is sometimes really helpful. The records are really complete and I am sure you will find your kin. Good luck. Tricia, I, too, am from the Dionne line. My paternal great grandmother was Almira Dionne; she was the daughter of Cyrias Dionne and Marcelline Paradis. I would be most interested in anything you find that you are willing to share (as it seems you have found much more than I have). I descend from the Dionne family, and my great-great-grandmother was a Deschenes. Her name was Salomee Deschenes. They were from the Frenchtown area of Maine. Fr. Henri Dionne was my great-grandmother’s uncle. You can look on the St. John’s website (not sure the exact name), but baptismal and other church records are available there. The owner of the website is also a Dionne descendant, descending from Hortense. Hi there !!! My name is Ronald Lee Dionne. I am a descendant of Catherine and Antoine Dionne. I have the complete records of our genealogy back into the 1600’s. Our ancestors first lived in Drummondville, Quebec and later the islands in the St Lawrence seaway. The first Dionne entered the United States around 1900 … his name a Pepere Dionne. Before Dionne our name was Guoinne… although there are various spellings. If you would like I can send you the complete portfolio we compiled. Send me your snail mail addy and I will make copies and forward to you. It is fascinating. The Pepere name you mention is interesting because it’s the old French name for grandfather (grandpere in French), which was used in Quebec in the old days. It’s still used in certain parts of the province. Pepere simply means Grandfather in Quebec slang. Good morning Sandra. Sorry for the delay. I just noticed your reply. I will send you all my info via your msn addy. Take care !! You are correct on Pepere as a common name for grandfather.